Planet X Cinema in San Antonio, TX is screening the first Guyver movie on the 22nd of February. Not the kind of news we are hoping for, but who knows, maybe this will spawn more Guyver fans. You can find further information here: https://www.sacurrent.com/ArtSlut/archives/2019/02/06/planet-x-cinema-strikes-again-with-free-screening-of-body-horror-comedy-the-guyver Plus it's free! This is most likely the optimist in me talking, but maybe just maybe, the prolonged hiatus is him actually finishing up the series. Like actually planning out the rest of the story and then getting it done in one fell swoop instead of doing the month to month pace, which could have been a hindrance? I know I am being foolish, but all I have at this point is hope. I'm getting to the point of sending Yoshiki Takaya a clip of Striker's rap from the first Guyver movie. ...That's how bad this is feeling to me right now. It reminds me more of Bloody Roar and the Zoanthropes. Still it is intriguing. Bio-Booster Armor Guyver, based on the real-life events of Yoshiki Takaya. At this point, I can't help but feel that we have now created a religion where on a monthly basis we reconvene with hope and faith to see if our savior has returned, only to be disappointed and wonder if we're not praying hard enough? Fingers are crossed that we get SOMETHING! Also, one interesting bit of news is that sometime today, the Guyver anime has now been added to Crunchyroll so...that's a thing now. As much as I would love for the anime to continue, another anime adaptation probably won't be considered until after the Manga finishes(which hopefully will be before the 40th Anniversary). I'll still sign it to say that there is a loyal fan base, but we probably won't see anything anime in a good while yet if at all. True, thought the Guyver unit might try to adapt to Superman's physiology, but it would probably just fail in the end. Thanks for the info. Yeah, safe to say that unless the Guyver gets stupid lucky, the win will go to Doomsday. Though I am almost certain that Superman equipping a Guyver Unit would be a guaranteed victory for the man-of-steel(man-of-bio-steel?). How would you want a live action Guyver TV series to be? If an American Live Action Television Series adaptation is made, I feel that it should follow the characters and story of the live action movies, maybe a reboot. I feel that no matter how much we may want it, the source material can only be truly conveyed rightfully in anime form. The live action movies is something that most if not all Guyver fans are familiar with and have accepted as a part of the Guyver fandom. The movies reached incompletion very early on and so if it was rebooted and continued, it would leave some room for creative freedom for like the story and it's progression, character development, and possibly introducing or foreshadowing more characters and events down the road. Also, Guyver: Dark Hero had done some world building and had unresolved loose ends that someone could very well add on to and continue. 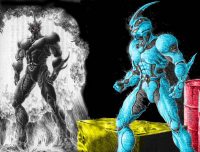 Imagine remaking the fight between Guyver Sean against the Fulton Balcus Zoalord and the Guyver-Zoanoid. I know that there are some theories that span from that the Unit suspended or slowed ageing altogether, to the host still ages, but when they bio-boost the armor "resets" them back to the original age in which the host and unit first bonded. In the roster image, are the team captains being represented by the gold like background? Looking for input on a Guyver fanfic I'm working on. Guyver0 replied to PowerofGuyver's topic in LET'S CREATING! I thought Max Pharmaceuticals wasn't referenced in the live movie adaptations. Everyone was calling Chronos "Kronos". So...In short we're just gonna have to accept things for what it is and hope that Takaya finishes the manga before he passes(hopefully far down the road) and then maybe just maybe he'll be more lenient with people making other creative adaptations with Guyver and have someone turn it into a harem action anime series like High School DxD? Am I reading this right or is this the implied message that everyone else is getting? Though there are no official titles, there have been separate fan made or unfinished projects of video games or skins for certain games. I know there are some skins for Skyrim and GTA: San Andreas. If Takaya being hard to work with is true, I wonder if it turned away any possible projects that others brought to him. When/if the series does come to an end, I wonder if he'll be a little bit more lenient in terms of creative freedom from others? So...is he acting out Archenphel? Alright alright, I know people may be tired of this discussion, but I can't put this theory I got a few days ago down. As far as I know there hasn't been a definitive answer, but if there is please correct me and end my madness. Okay, so the question is why was Guyver 2 consumed, but Guyver 1 wasn't when they both lost their control metals, right? Well my theory is Guyver 1's end result is what's suppose to happen; the organism becomes a bio-boost creature. The reason I think Guyver 2's end result was him being eaten alive is because the Guyver organism that Guyver 2 possessed was being "starved". The organism is sustained by "feeding" it the host's bio energy, right? Well what if Guyver 2's control metal wasn't regulating that process correctly due to it being damaged. This could explain why the organism would act up and cause a tremendous error when in use for extended periods. However, once the organism was freed of the control metal, it was "starving" so much that it decided to consume anything it could, including the host. It might explain why Valcuria/Guyver 2F is suffering the same thing because her false control metal isn't regulating that correctly either. What are your thought. Guyver 2 was cool and he had a very unique design. I do believe though that if he didn't have a malfunctioning control metal, he would be the strongest of the three. However, the reason why he was malfunctioning was due to the fact that his control metal was damaged back when the bomb/grenade that Malmot had exploded before the unit was activated and Lisker became Guyver 2. The scientist that stated his immune system hadn't fully adapted to the new bio-boosting system was a guess on his part, but the scientist was wrong in that regard. When the control metal malfunctioned, Lisker didn't realize it was the control metal. He actually thought that the damage to the control metal was superficial, but that proved to be disastrous for him. So I believe that the bio-boosting system integrated fine, but the damage to the control metal from the beginning was his downfall.